It’s not exactly Groundhog Day, but it’s as much a sign that spring is around the corner in New England as any shadow-seeking critter. That’s right, Sox fans, Truck Day is here! 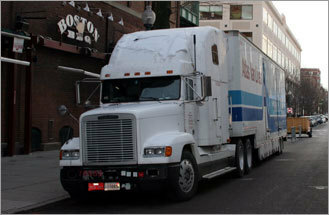 The 18-wheeler that carries the Red Sox’ spring training equipment from Boston to Fort Myers, Fla. departs Fenway Park this morning to make the 1,467-mile trek from Yawkey Way to Edison Avenue. It probably won’t cure your Patriots hangover, but it’s at least a step in the right direction. Boston.com’s Steve Silva was there with his camera when the truck arrived at 7:35 a.m., and has built a photo gallery of the festivities. And if you want to see more photos of the truck being loaded up with bats, balls, and any other stuff the Sox might need in Fort Myers (a motorcycle or two, perhaps? ), check out our photo gallery from last year’s Truck Day. Or the one in 2006. The Red Sox say the truck will depart from Gate B around 10 a.m. In past years, it left closer to 1 p.m.
Click here for the Red Sox’ full spring training schedule.